The Luxe La Cienega at La Cienega Boulevard and Westmount Drive. 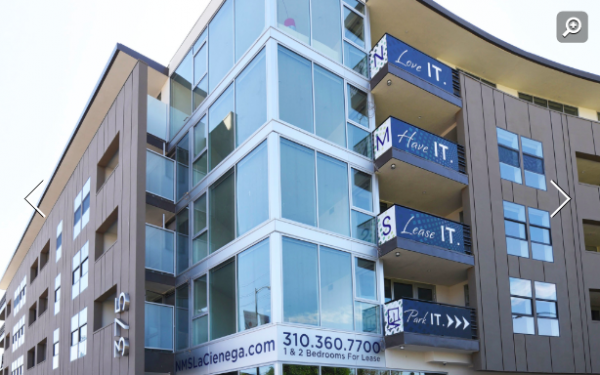 The Luxe La Cienega, an apartment building at 375 N. La Cienega Blvd., one of nine properties that were part of a joint venture between Neil Shekhter/NMS Capital Partners and hedge fund AEW, is now controlled by SPI Holdings of San Francisco. The transfer of ownership, originally reported by the Santa Monica Daily Press, is the result of a judge’s ruling in a lawsuit by AEW over Shekhter’s effort to buy out its $60 million investment in the properties. Seven of them are in Santa Monica and one is at 9901 Washington Blvd. in Los Angeles. While Shekhter filed an appeal, in November a judge ruled that SPI could take ownership of the nine properties. The 125-unit Luxe La Cienega is at the intersection of La Cienega and Westmount Drive.